Listen to God&apos;s Divine Call! 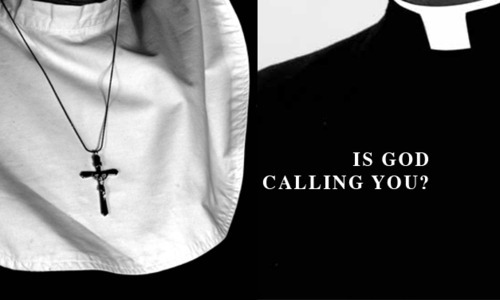 Contact your Vocations Director today! to learn and help discern your Vocation! There is more than passing value in stressing the fact that a religious vocation is a grace. It is, therefore, a gift and an opportunity that must be freely responded to if the grace is not to remain sterile and ineffective. We used to speak, and perhaps still do, of promoting religious vocations. Actually, we cannot promote vocations. Either God gives them or they don&apos;t exist. We can only discover what God has given and then foster a vocation that is presumably there. How do you discover a true vocation? The expression "true vocation" is not casual. It is critically important in an age when so many once-promising vocations seem to have been lost. What are some typical features of a true vocation to the religious life? in the footsteps of Jesus Christ. I believe that if every prospective candidate were to make a private retreat, even for a few days, under a competent priest, it would help immensely. The retreat could be especially geared to a person who thinks that he or she has a vocation to the religious life. The practical question arises of how to recognize a true vocation to the religious life. The need for recognizing a vocation is so important that everything else is secondary. Then, during the retreat, in an atmosphere of silence and prayer, ask God to enlighten one&apos;s mind as to whether or not He is calling the person to a life of Christian perfection. This, in fact, is one of the original purposes of the Spiritual Exercises of St. Ignatius: to discover and decide on one&apos;s state of life. The future of religious life is very promising, but the promise depends on certain premises, of which the first and most important isthat God has given not just the initial call but the assurance of a lifetime of His supernatural grace to those who want to serve Him in the religious life. the mission of Jesus by sharing my love with others. Stenghten me to respond to Your Call each day. a difference in others&apos; lives. listening hearts and the courage to respond to You. serving as Lay Minister, Sister, Priest, Brother, or Deacon. Amen.